Tomorrow, Monday 12 Sept, the new movie by Jonathan Demme about 2011 Massey Hall shows will screen at the Toronto film festival TIFF. Location: “Princess of Wales” – nice name. 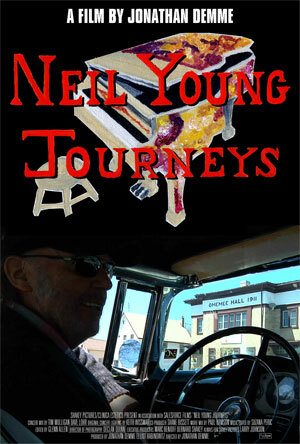 More info on NeilYoungTimes/news. Our special reporter Sharry is on scene. Just saw the screening of Neil Young’s Journeys in the Princess of Wales Theatre, Sept 12th with a post show chat with Jonathan Demme and Neil. The movie was very good and features some psychedelic Neil spittle cinematography. They beefed up the sound system, with speakers throughout the theatre. If I heard correctly, Jonathan Demme said that movies only use 48 MHz at best but Neil suggested they up it to 96 MHz. Not sure what that means, but it sounded great- the whole theatre rumbled with that intense low Le Noise effect that Daniel Lanois gave to Neil. thanks for your comment Horg! 96 MHz means they doubled the sampling rate vs. the 48 Mhz, which gives a much higher sound quality. You know, Neil is a sound-freak, always on the edge of technology to reproduce the sound as authentic as possible. Upcoming is maybe a report from Sharry about the post-screening Q&A session with Neil. Stay tuned.